September 27, 2011, Culver City, CA – Speakal www.speakal.com, a lifestyle-oriented home entertainment company with intelligently designed technology solutions driven by a passion for sound, launched today iHog, the stylish hog-shaped iPod/iPhone docking station speaker system. Available in pink and white, the booming iHog speaker system makes a fun holiday gift for kids, teens and adults that love music. Based on Speakal’s best-selling iPig docking station, the iHog is more powerful and portable, with a battery-operated docking station that features easy-touch Humanized Touch Volume Controls to adjust the iPod’s navigation with a light touch of the hand. Just push the hog’s ears to turn the volume up or down, or its head to skip tracks, pause, or stop or use the included remote to adjust the controls from a distance. In addition, the iHog also lets you add drama to your movies or gaming -- just connect iHog to a TV, gaming console, or other music source with the included 3.5mm to amplify sound with its super amplification system. Based in Culver City, California, Speakal Corporation develops home entertainment speaker systems with clarity of sound, intelligent technology, and visual appeal. With unique looks that blend state-of-the-art with the latest technology, Speakal’s products are official products for iPod and iPhone, including the iPod Touch, iPod Nano, iPod Shuffle, iPod Classic or any iPhone, bringing crystal clear sound to your favorite tunes. A privately held company, Speakal earned its worldwide recognition by delivering unique product designs to customers around the world, in the United States, Canada, Asia, Europe, and the Middle East markets. Established in 2008, Speakal continues to gain market share by introducing new audio product designs and diverse product lines that relate to the varied end-user lifestyles that combine high quality sound, styling durability and functionality. Speakal products are made with eco-friendly and RoHS compliant components and materials. For more information, see www.speakal.com. Geez! 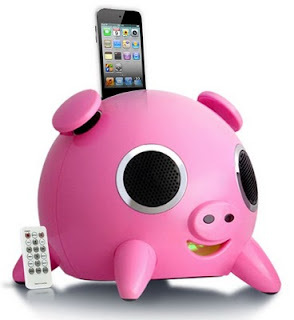 this Hog-Shaped iPod Docking Station looks so cute. I love it. It will surely look good in my home entertainment are. thanks for this great post. The children don't have to have their headset stuck to their minds to savor some music, works great for the family trips. I will be picking it someday.